Here's a sketch of this morning's sermon - sadly I didn't record it! All of us have been appalled by the tragedy and trauma of IS’s almost unstoppable surge across Syria and the surrounding region. What has been particularly distressing has been their iconoclasm of non-Islamic sites - especially places of Christian history and worship. That in itself would be serious and disturbing, but what has been all the more shocking has been their attempt to wipe Christianity from the page of Syrian history, but not just Christianity. Since the conflict began as an anti-Government protest in 2011, an estimated 200,000 people have been killed. As we celebrate the faith and martyr’s death of fellow Syrian St George this week, (the same St George adopted by the racist right on the edge of English politics) and the debate about immigration and nationalism rumbles on as an undercurrent leading up to the election, I am left asking questions about what makes us human and how we identify ourselves. We do all want to fit in though. Most of us do not like standing out from the crowd. When I encounter anyone vaguely from the North I struggle to recapture the Lancashire accent I never really had. How do we want to be identified is a constant question - the clothes we wear, the music we listen to, the newspaper we read, the shops we go to all say much about us. They say you can’t judge a book by it’s cover - yet we make all sorts of snap-second decisions about the person walking towards us in the street based on how they look, their attire, age group and so on. This morning’s Gospel races in without pausing for breath from the story of the encounter 2 disciples had on the road to Emmaus with the Risen Jesus. He walks and talks with them about all that has happened in Jerusalem and how all scripture point to Him, but it is only in the breaking of bread back at Emmaus, that those disciples finally realise that it is Jesus who has been with them and then he disappears, so they race back to Jerusalem to tell of what they’ve seen and experienced. Whilst they were still talking about this, Jesus came and stood among them and said ‘Peace be with you. They were startled and terrified…’ The world that they though they know and understood had suddenly become unsettled and uncertain. Story - 3 zebras on the lose in Brussels. Apparently the animals were unsettled by the removal and sale of some stable mates. They trotted the streets of the Belgian city eventually to be captured. 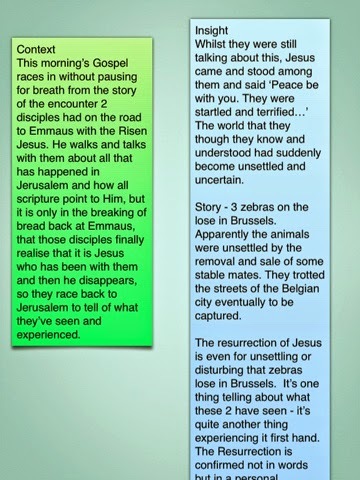 The resurrection of Jesus is even for unsettling or disturbing that zebras lose in Brussels. It’s one thing telling about what these 2 have seen - it’s quite another thing experiencing it first hand. The Resurrection is confirmed not in words but in a personal encounter. Jesus offers their fear and doubt His peace - on the one hand a normal greeting as ordinary as ‘good morning’ on the other is shorthand now for God’s saving love at work in Him. Everything that once was ordered is now reordered by God because of the Resurrection. Touch me and see… They gave him a piece of broiled fish and he ate it in their presence. Luke goes to great lengths explaining that this is Jesus - not some vision or disembodied spirit. The same Jesus who taught them and lived and loved with them is present with them now. Story: Actions speak louder than words - It's the little things that help make love last, with cuddles and even making a cup of tea topping a list of activities that help keep couples together. Even making sure to say 'thank you' as a simple token of gratitude for everyday mundane tasks can make a difference, alongside grander gestures such as giving surprise presents according to a study from Open University about keeping their relationships on track. Bouquets of flowers and boxes of chocolates were seen as less valuable than small acts of kindness. A simple 'I love you' can work wonders, according to the study, which characterised this as a symbol of ongoing closeness among couples. The Risen Jesus’ presence speaks loud and clear to those fearful disciples then and now. The Jesus they encounter now is still the Crucified One. He bears the marks of His suffering love for us. The Cross shows us the lack of the limits of the love God has for us - the Risen Jesus continues to call us to walk alongside, to serve and suffer with and ultimately love others. And he said to them, ‘Thus it is written, that the Messiah is to suffer and to rise from the dead on the third day, and that repentance and forgiveness of sins is to be proclaimed in his name to all nations, beginning from Jerusalem. You are witnesses of these things. Jesus was stating a fact, but also giving his closest a new commission. Story: Cast your minds back to February of this year - many across faith and political groupings were shocked by the capture of and ultimately the beheading of 21 Coptic Christians in Lybia. Bishop Angelou - leader of the Coptic Orthodox church in Britain described the murder as a disregard of life and gross misunderstanding of its sanctity and value in all people. The Pope described these murdered Christians as Martyrs for their faith. Martyr - witness. To speak authentically and truthfully as if under oath, of the experience we have have had of and with Jesus. Part of being people who gather with these disciples, post Resurrection, is that we are called to be a witness. No hellfire. No judgement. Not shoving something down others throats but it is about telling others when we have sensed God at work in our lives - at school, at home, at work - through a stranger, a doctor, a neighbour an act of compassionate love. What is Jesus saying to us? If you were put on trial for being a Xn would there be enough evidence to convict you? Does what believe in your head and heart shape the whole of your life. Best sermon I can preach is showing them they are loved. Are you willing to be a witness to Christ? To speak of what you have experienced to others and to allow that experience to continue to transform your life so others may see Christ in you? perhaps we should do less proclaiming the resurrection and more allowing people to encounter Him in us?